Of all the chicken tender recipes out there, these quick and easy Keto Buffalo Chicken Tenders are so good, you will never even know that they are low carb. 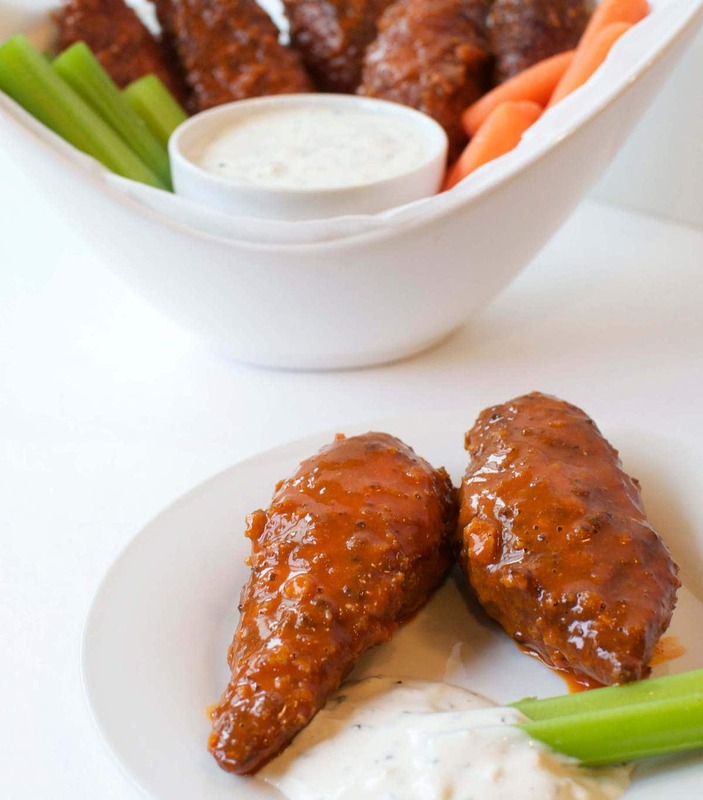 These Keto Buffalo Chicken Tenders are so good that you would never be able to tell them apart from the ones served on your local bar menu. 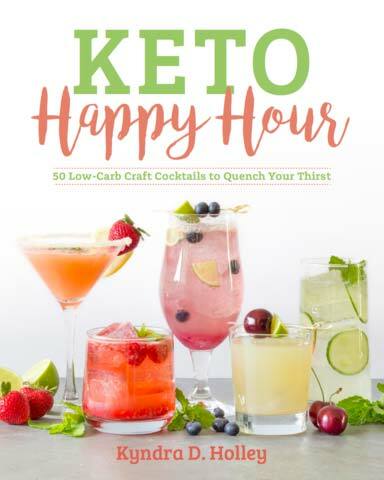 Now you can have all the flavors of your favorite low carb appetizer, but without all the extra carbs. I have always loved crispy breaded chicken tenders. Even as a child it would be the first thing my eyes spotted on the menu. Now, even as an adult, I still love them. Things are just a little different these days as I make my own keto chicken strips at home. For many of you, your first instinct may be to walk away when you see pork rinds listed as an ingredient. Trust me when I tell you that you cannot taste them at all. I have never really been a fan of pork rinds, but when used as a low carb breading option, you would never even know they are there. Combining the pork rinds with the Parmesan cheese and the seasoning makes a perfectly crunchy keto breading mix that you can’t tell apart from its gluten-filled, floury counterpart. These keto buffalo chicken tenders are the real deal! 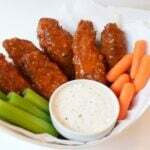 A few notes about this Keto Buffalo Chicken Tender Recipe: Instead of frying them, you can bake them on parchment paper at 375°F for 15 to 20 minutes. For either method, be careful not to flip them too many times as this will cause the breading to fall off. 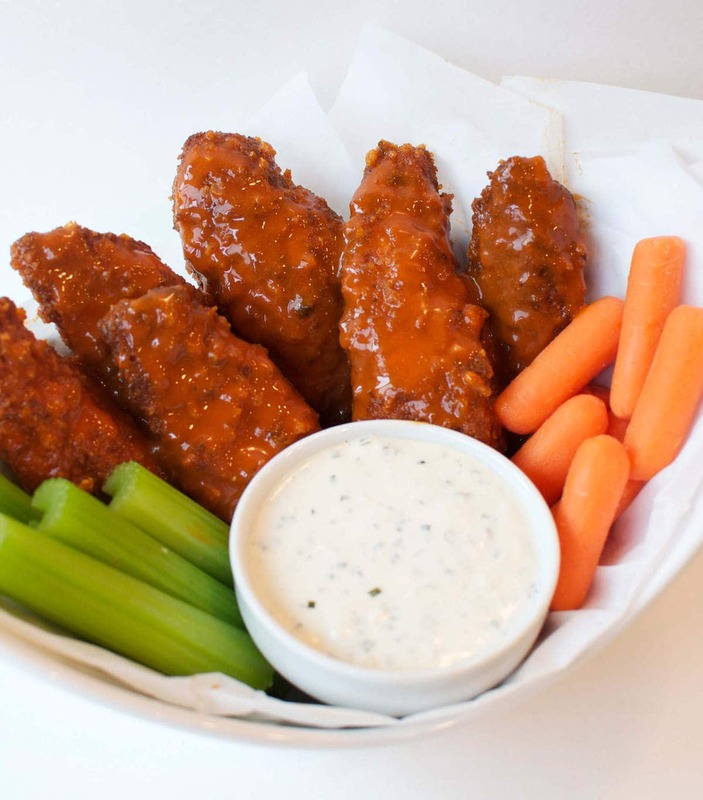 There are a couple of other ways I like to make these—tossed in low carb barbecue sauce or tossed in a fifty-fifty mixture of low carb barbecue sauce and the buffalo wing sauce. That last combination is my absolute favorite. These low carb buffalo chicken strips are amazing dipped in my Dairy Free Keto Ranch Dressing. Or better yet, if you are a blue cheese fan, try this Chive Blue Cheese Dressing. 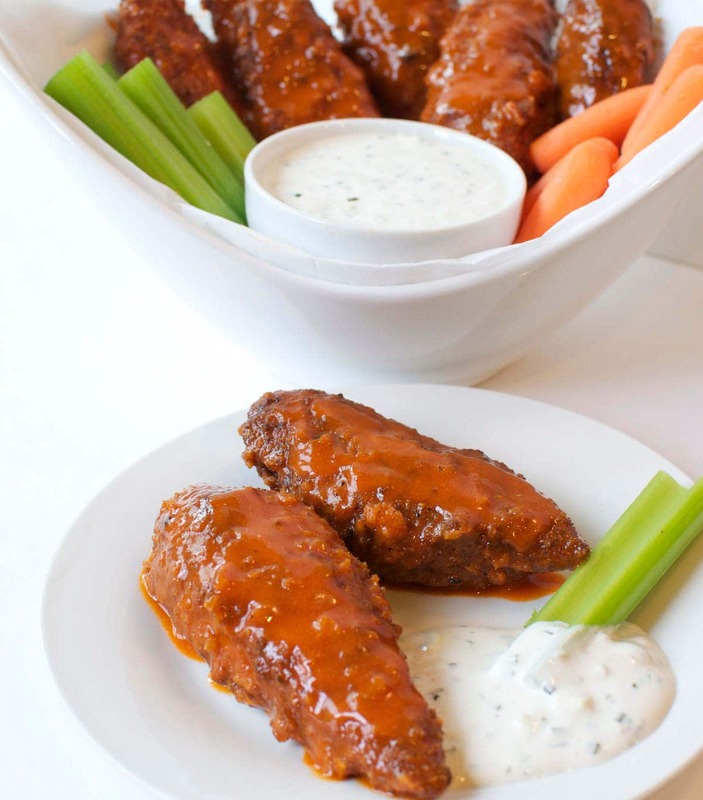 If you are a fan of Keto Buffalo Chicken Strips, then this is sure to become your go-to recipe. From the cheese, eggs, and seasoning. Eggs are just under 1 gram of carbs each, cheese is about 1 carb per ounce, and then there are the carbs for the spices as well. Substitute for pork rinds please? Thanks for the recipe! I’ve also seen recipes for almond flour as a replacement for pork rinds. I made this recipe the other night with almond flour and it was delicious! I’m not a big fan of the smell of pork rinds so it was a definite improvement for me! Delicious, and super easy to follow recipe. My husband – who hates pork rinds – loved these chicken tenders. Definite make again recipe. 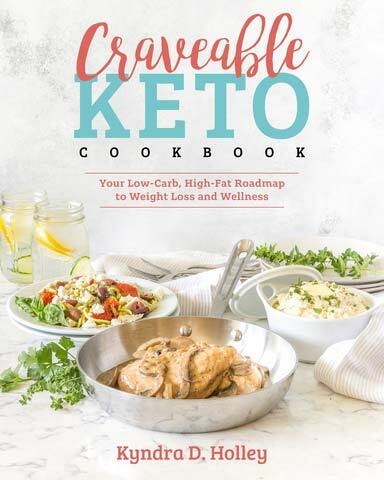 I’m new to Keto and have tried some recipes that were not very tasty. This one is legit. 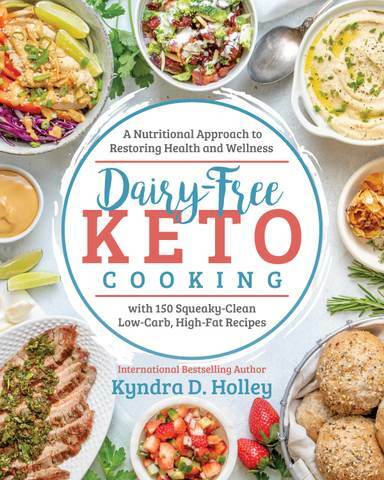 This gave me hope that Keto can improve my health and taste delicious. Thank you! Great recipe.. simple steps. Great results. 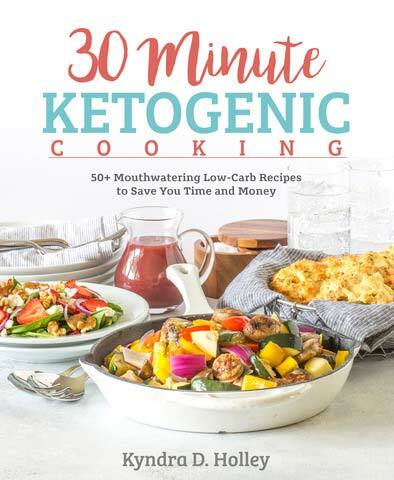 This was the BEST keto recipe I have tried to date! I don’t normally comment on things but if you’re thinking about making it, do it. We aren’t big pork rinds fans and you could never tell that’s what was used. I was wondering if these could be made in the air fryer? Thank you!! These are the bomb. I am going to try the recipe with shrimp. How does cooking them in the over turn out? Pretty good? Or better to just use oil? These are delicious! They were a huge hit. Can they be baked? The amount of oil I need to use to keep breading from coming off is insane! Omg so delicious!! This is going to be my new go to meal prep recipe because it was so easy to make. My only annoyance is that there was so much of the mixture left over once I was done with all the chicken. I think it could easily stretch to another pound of chicken which would ultimately bring the carb count down.